Seven-time champion Serena Williams advanced to the Wimbledon semifinals with a 3-6, 6-3, 6-4 victory over Camila Giorgi of Italy. Williams dropped her first set at this tournament as the 52nd-ranked Giorgi produced an impressive display of power and accuracy in the opener. 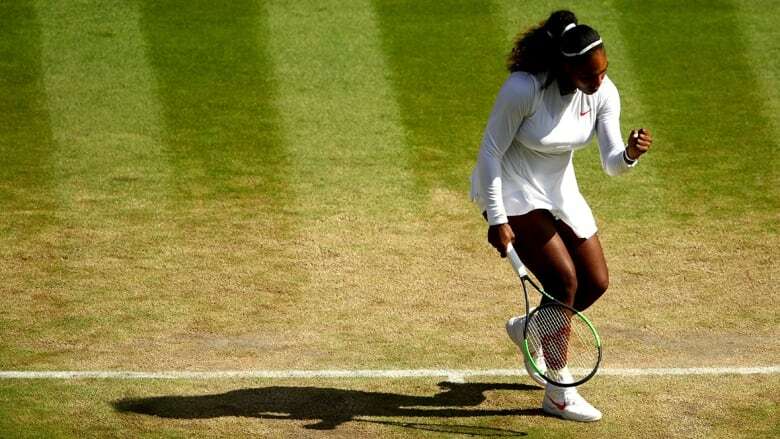 Williams moved closer to her eighth title at the All England Club and 24th Grand Slam trophy overall — but first since missing more than a year while having a baby — by beating 52nd-ranked Camila Giorgi of Italy 3-6, 6-3, 6-4 in the quarter-finals Tuesday. This is all brand new for Goerges, who had never even been to a Grand Slam quarter-final before this week. Plus, at Wimbledon in particular, she lost in the first round each of the past five years. "After the first set, I was like, 'All right, let's go three sets.' And that's kind of what I thought. ... 'I'll just keep fighting,"' Williams said. In the last men's quarter-final, which was suspended because of darkness after the third set Monday night, 2009 U.S. Open champion Juan Martin del Potro defeated Gilles Simon of France 7-6 (1), 7-6 (5), 5-7, 7-6 (5). Meanwhile, the British team of Harriet Dart and Jay Clarke upset the top-seeded duo of Ottawa's Gabriela Dabrowski and Mate Pavic of Crotia 6-3, 6-4 in third-round mixed doubles action.